The hypnotic land of Daman with its sun-kissed beaches, marooned location, opalescent waters, ornate architecture and tropical flavor exudes an unsurpassable charm. With its myriad visual delights, the place is a favorite holiday destination among tourists from all over the globe. People regale in its bounty, far away from the cacophony and razzmatazz of cities. Be it watching the sunset by the seashore; making sandcastles in the golden sands; basking in the pleasant weather; enjoying various water sports; or just gamboling around; the singularity of Daman stands out from every corner of its landscape. Earlier known as 'Damao', this coastal enclave is situated in the western part of India - on the southern border of Gujarat, and stands surrounded by the pellucid waters of the Arabian Sea on all its sides. An erstwhile Portuguese colony during the British Raj, Daman was later incorporated into the Indian Republic, along with Diu. These twin islands were major districts of Goa till 1987, and later made a separate union territory, when Goa attained statehood. The little city of Daman cozily rests within the Daman district and is divided by the Daman Ganga into Nani Daman (Little Daman) and Moti Daman (Big Daman). Nani Daman is a hub of epicurean magic with the innumerable restaurants and bars that are located on this part of the city. With its huge array of exotic liquors and culinary delights, it is the perfect place for the gourmand. The piquant aromas that fill the air and the tempting delicacies that tickle the taste buds make it a favorite hangout among the locals as well as the tourists. Moti Daman, on the other hand, is a repository of imposing architectural grandeur. Colonial edifices in the form of Gothic cathedrals, museums and fortresses abound the place and makes one reminisce a bygone era with awe and admiration. 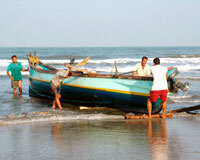 Apart from its rich historical heritage, Daman also boasts of a colorful and multi-faceted culture. It is a unique potpourri of the tribals and urbans, Indians and the Europeans. All these cultures blend and merge together in the melting pot of Daman, and give rise to its ornate cultural heritage. Moreover dance and music occupy a place of prominence in the daily lives of the Damanites. This gives the place an exuberance and luster. So what are you waiting for? This wonderland beckons you all. Just embrace the glory of this island and enjoy a medley of some of the most fascinating things in life.